We are all great fans of festivals as they are way to promote our culture, to bring the cultural harmony and also to feel the freedom! We try our best to manifest our inner love and happiness for festivals about to come! The best way to express your feeling for the festivals is to decorate your home and surroundings with respective decors, signs and symbols related to that celebration! 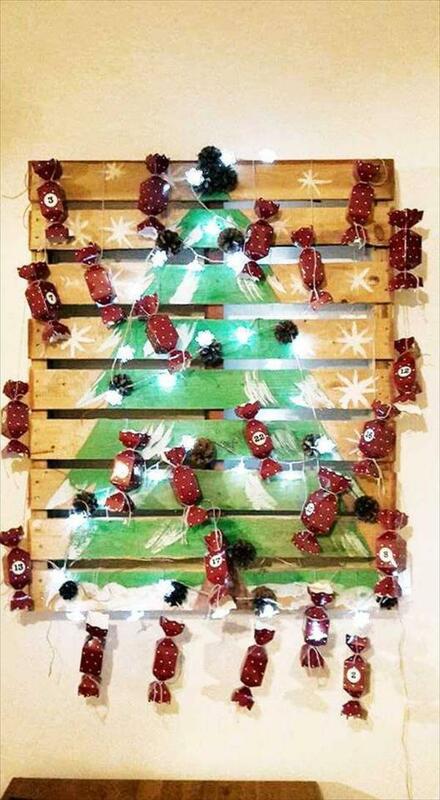 Now your festival is to come and these DIY wooden pallet trees would perform as best ever decor for that! 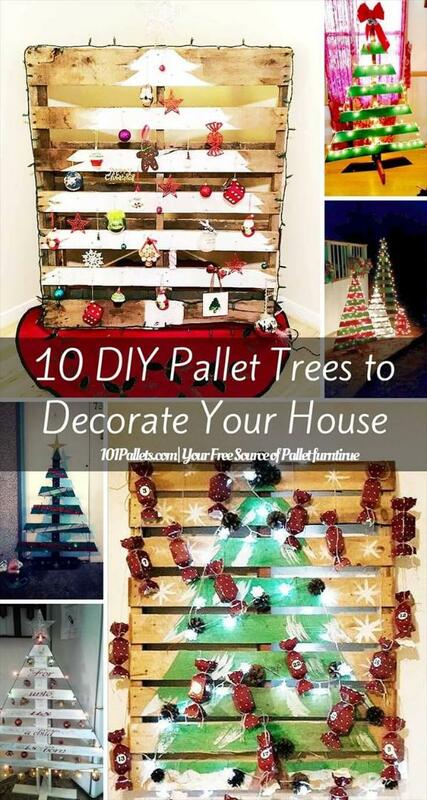 These stimulating manifestations of trees are pallet-made and have exclusively been picked to give you some more brilliant concepts about festival tree decors! 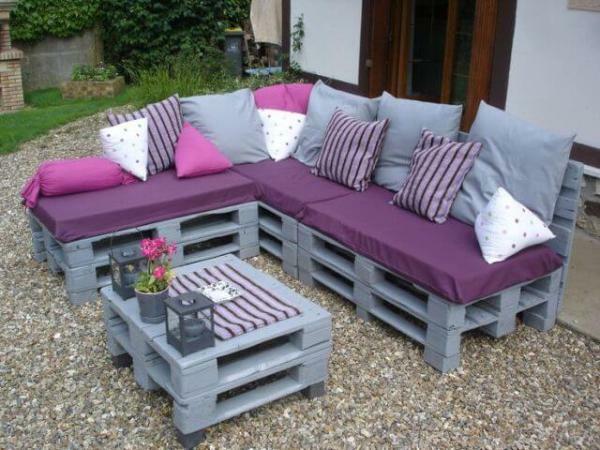 All you need is to gain some free pallets which would serve as total supply for these tree constructions! This is just a great offer for all DIY lovers to celebrate the upcoming festival with full potential! 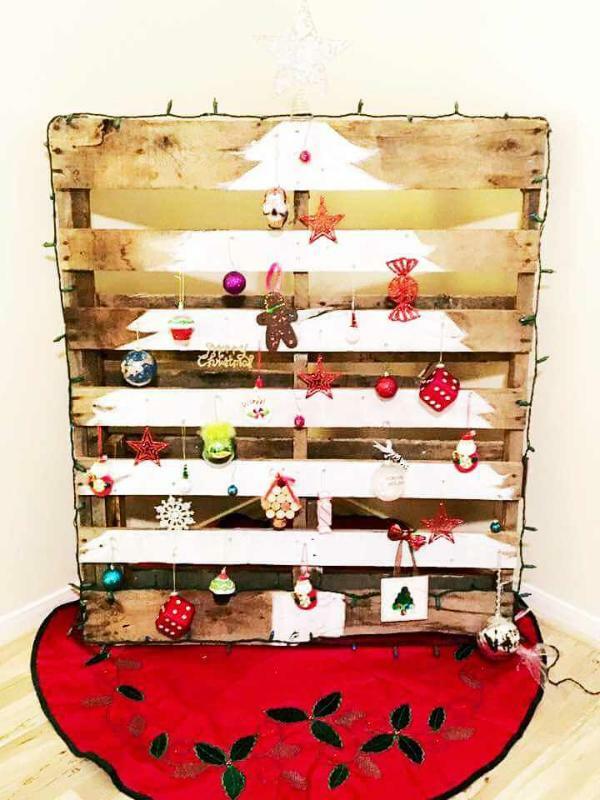 Explore the given collection of DIY Pallet Tree Ideas and we are sure that you will find yourself inspired at the end! 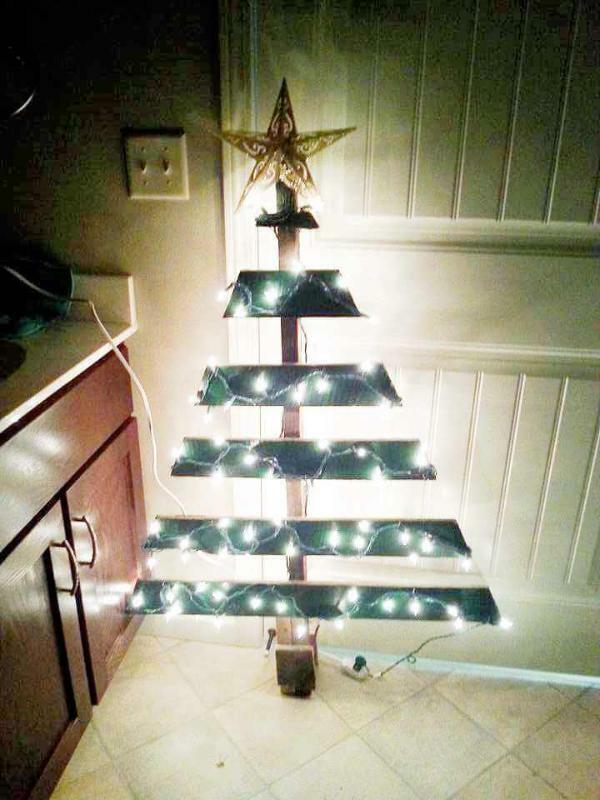 Install this tree shape using pallet slats, or directly cut this tree design out from a pallet board! 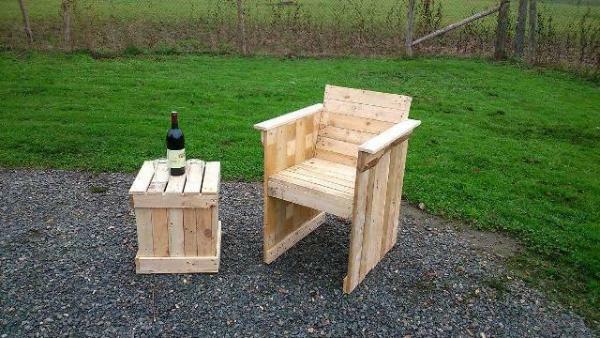 This would make a perfect festival decors and is also much gift-worthy! Painted in white, green and red just for a stand out appearance! 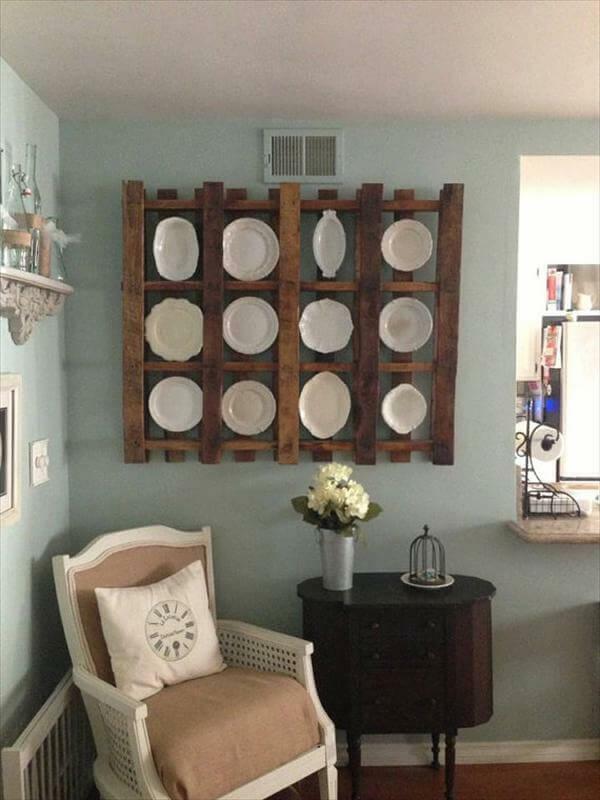 Create a cone shape out of removed pallet deck boards to gain a festival tree decor! 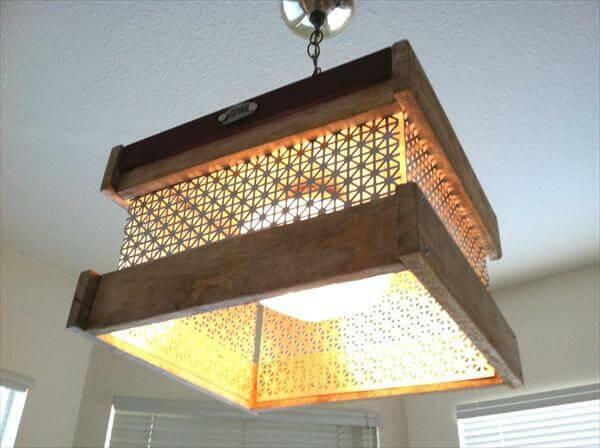 It has been loaded with LEDs for a charming light spread all around and also to get noticed even in darkness! 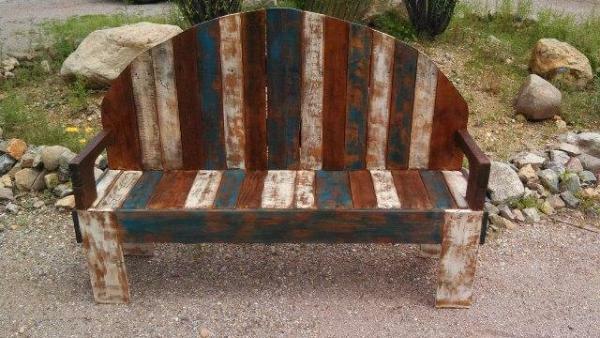 If cutting makes you bored, then paint a beautiful tree directly on a pallet skid! 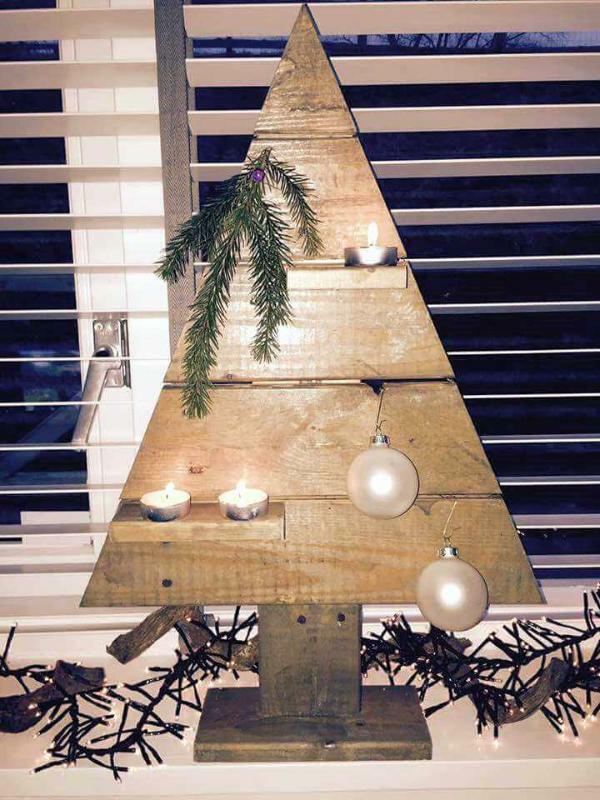 Get inspired of this brilliant layout of tree, made of only one miniature pallet skid! 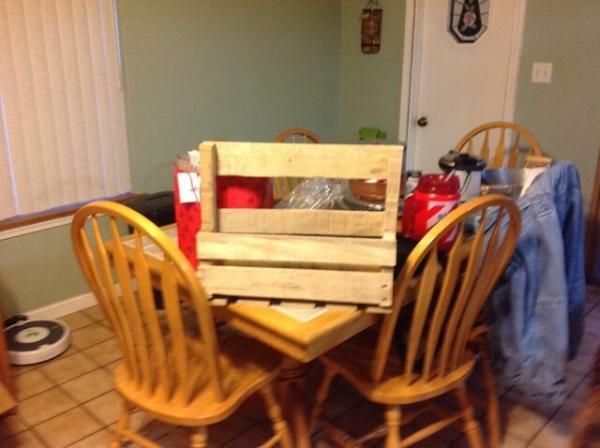 This one comes with a red gift bow tie, mounted at the top and can be given as a gift at some special event! Painted in green and loaded with light to get a total distinction! 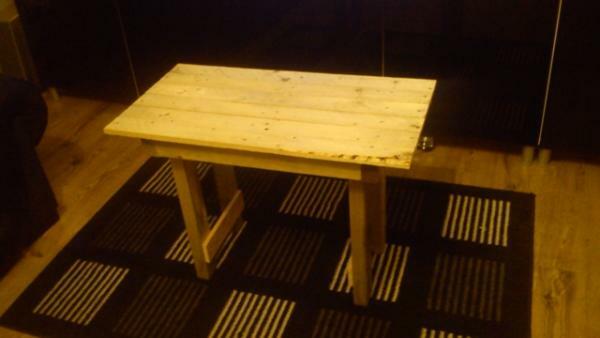 Comes with a base like (+) sign and can stand alone on any flat surface! 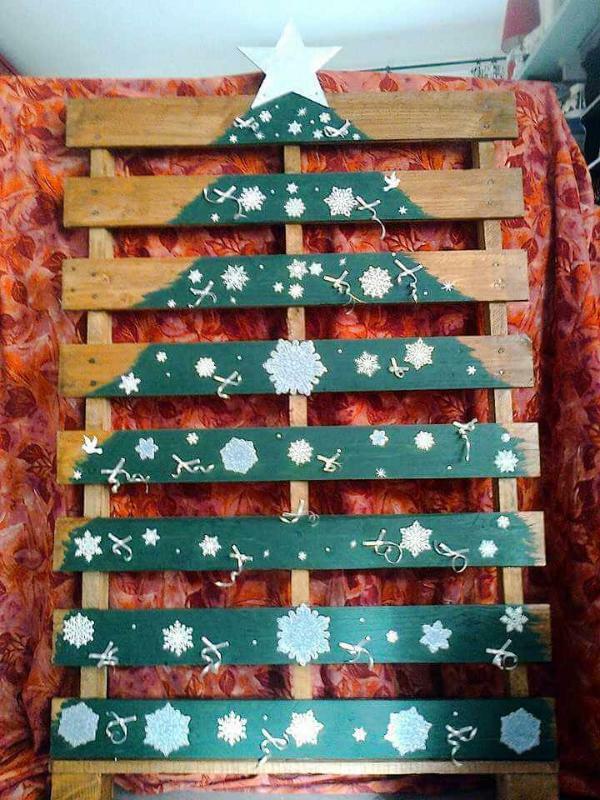 Paint a pallet boards just to display a tree shape in any color and get a fab tree decor! 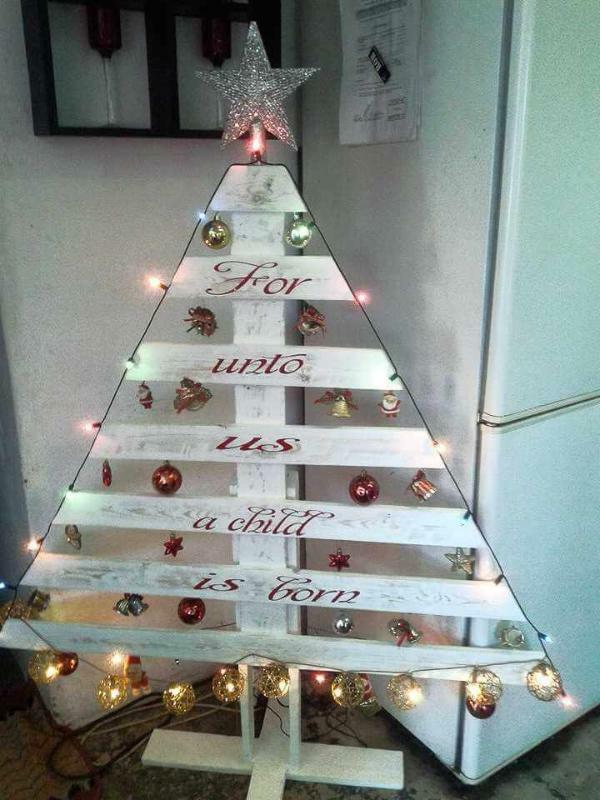 Now load the stuff which kids like the most like candies, cartoon toys and baubles for festive mood of this tree! 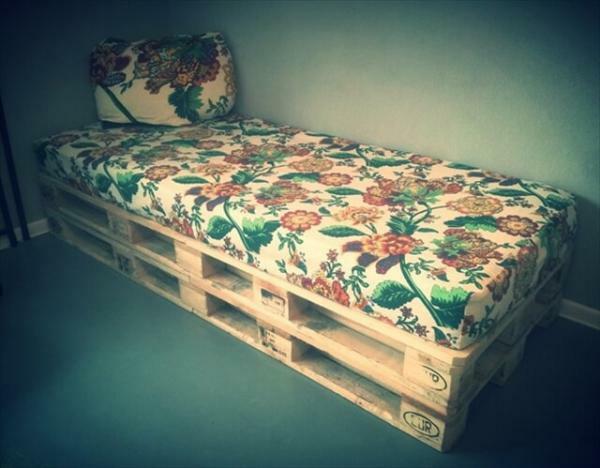 This one has also been designed with straight pallet boards removed through a process! Given an additional boundary line using wire containing colorful lights! Tagged with a glitter star accent at the top! Baubles have been installed as usual to create the decorative statements! This one comes with a pure baby or kids them as candies have been used as ornaments! 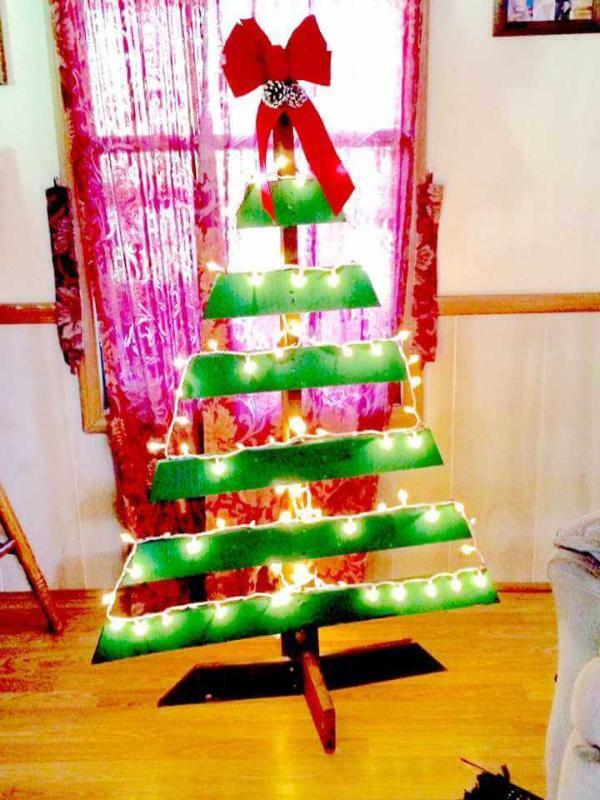 Using green paint tree has been displayed over a mini pallet skid then a random assortment of candies just create a divine look of this tree! 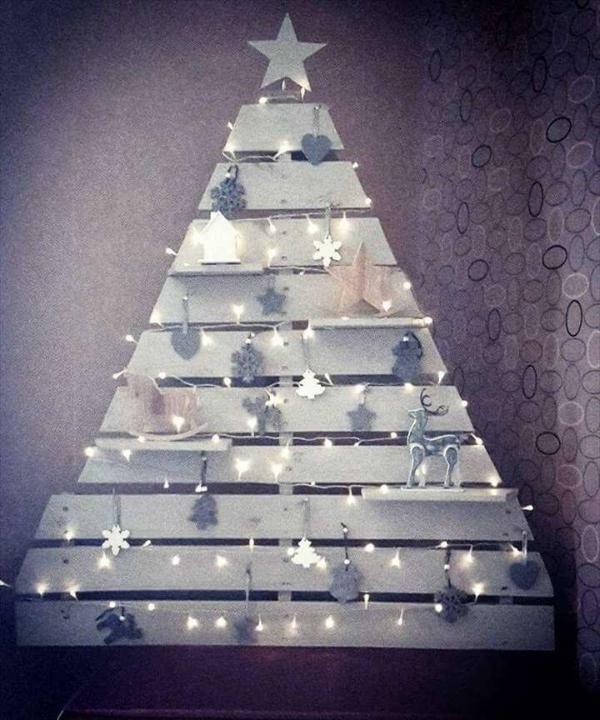 Give custom theme to your pallet-made trees just like this pallet tree made on a snowy theme! 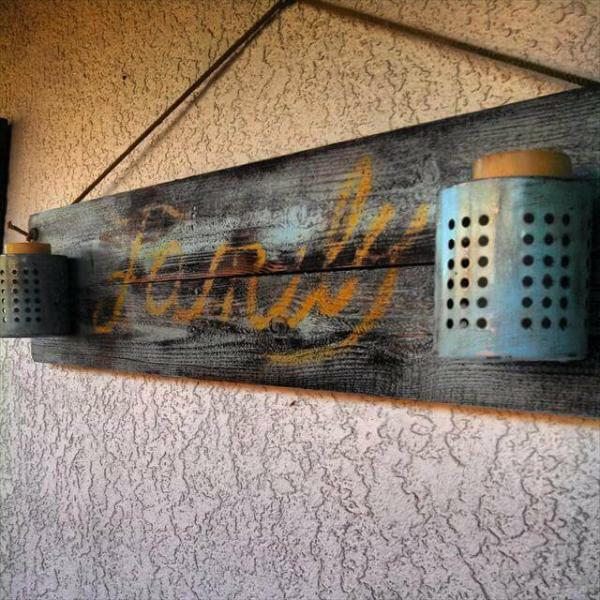 By adding nails little decors have been hanged that double up the overall beauty of the design! 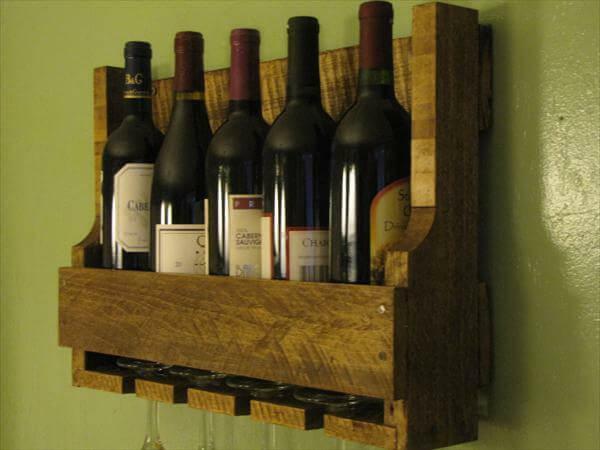 Little shelving levels just allow the user to display more artful stuff! The tree has been finally given amazing light effect using LEDs! 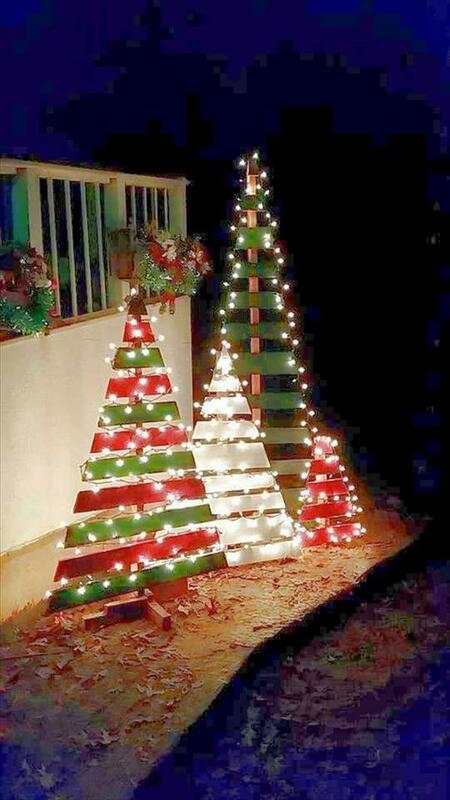 Make simple triangles out of pallets and use them as festival tree decors by adding a some flat bases or bottoms to them! Little shelving levels have been installed to hold the candle lights, some natural tree greenery and baubles have also been hanged on some fixed nails! 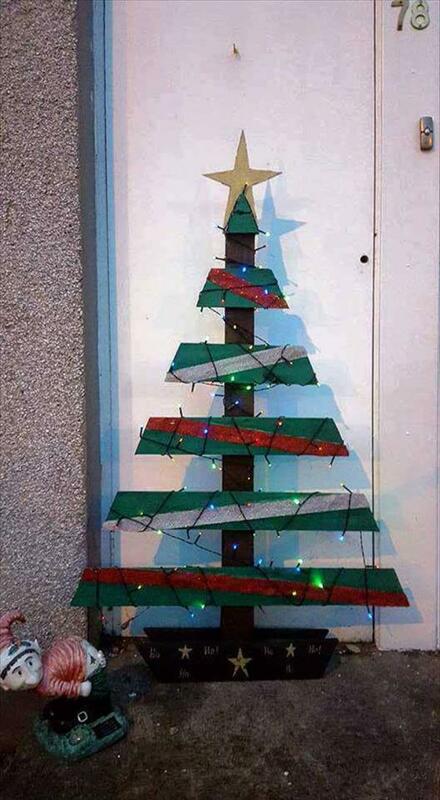 Here is a bunch of tree containing small, large and extra large wooden trees, all are made of pallet wood and are zero in cost prize! LEDs have been installed for a rocking light spread and to highlight the trees at night!